(a) Install a new brake booster gasket onto the hydraulic brake booster. (b) Install the hydraulic brake booster with the 4 nuts. 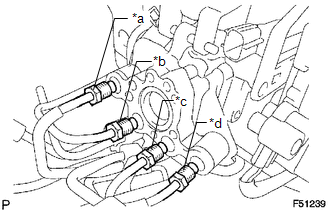 (c) Using a union nut wrench, connect the 4 brake lines to the correct positions of the hydraulic brake booster, as shown in the illustration. (d) Connect the 3 connectors.